If you have been in Web Development for a quite some time for now especially as a Front-End Developer and you use Webpack for bundling your application's code (React) into a single loadable bundle for serving your application full browser-supported. But in cases you work on large apps that includes hundreds of components and routes and you use the default Webpack Configuration to bundle and build the main bundle plus its asset you will find problems when it comes to the bundle size, it will huge (like 4MB - 6MB) and that for a Web App that gets delivered from your server to thousands of people at the same time, Well it is not good idea at all. So I'm gonna try to give you some tips used by teams working on large apps to reduce the size of their main bundle but you will find your self-splitting your code over multiple bundles depending on the structure of your app. If you're new to Webpack and want to learn how to configure your own build environment you can watch this Tutorial. So consider adopting the ways that only works along with your code base and app structure, for ex: for React apps it may differ. Here is the Demo Project we are going to work on. So when it comes to reducing the bundle size you have to understand how your code is being bundled and compiled together using Webpack and what dependencies are included plus which modules are being used and info about each module to be able to recognize your code base and see the flows and what dependencies are being included but are not being used or only part of the module is used. There is a lot of Webpack plugins and modules that allow you to analyze but we are going to use webpack-bundle-analyzer specifically since it provides a simple User Interface and easy to understand in order to deeply see through you bundle. Make sure to clone the project from the Github repo provided above, However you can use your own project you want to try to reduce its final bundle size. Go under webpack's config file and add the analyzer plugin. After adding the plugin just run the Webpack build. From there you need to analyze each module and see what dependencies it has it works like a tree so each dependency comes after it's callee module and so on and so forth. On the left side, you find your imported module (third party node_modules packages) while on the right side there is your app source code and scripts. Try to figure out what modules are taking large space on your bundle and try to link them with your app to see if they actually do something or you're blindly importing something that you don't need or even don't use anyway, afterward try to fix it on your source code. In our Demo app, we are using the find function from Lodash set of function and we are including all the functions and letting Webpack adding them to our bundle without even noticing, therefore, we can just import the find function instead offset of functions. If you try to fix your dependencies and imports and running the build again you should notice a difference on the bundle size between now and before. Splitting you Code into two or more bundles is very necessary when it comes to a full dedicated application that is so large and has a lot of routes, pages, features, and nested User Interfaces if you skipped this part and tried to put everything in one single bundle that will be very expensive when it comes server loading and user experience and your app performance overall. You simply use Code Splitting technique to split code that is dependent from each other into different chunks (bundles) and use them whenever the user tried to use a specific functionality or even access a router on your apps, this helps a lot when it comes to single page apps and React apps. On our Demo Project we are using the find function dependency from Lodash module (set of functions) and let's say that this function is only going to be needed when the user tries to get a list of available Front-End Frameworks but it is not necessary to load it at Web App startup and initialization. The simple solution is to split your app's code into two bundles (main bundle and vendor bundle or chunk) So your app main functionality will be separated from another third party function, also, it is better to load your app with a smaller bundle while loading other vendor's bundle after initialization. Go into your Webpack main configuration and make sure you are using Webpack v4 or higher since the API changed from the previous versions. Using the Split Chunks configuration you can customize which modules get added to a separate chunk bundle and gets separated from the rest of the main bundle which is mainly should be for your initial app code. Also, Add the chunksName configuration to the output section on webpack.config.js to customize the name of the custom chunks bundle's name. Now try to run the build. 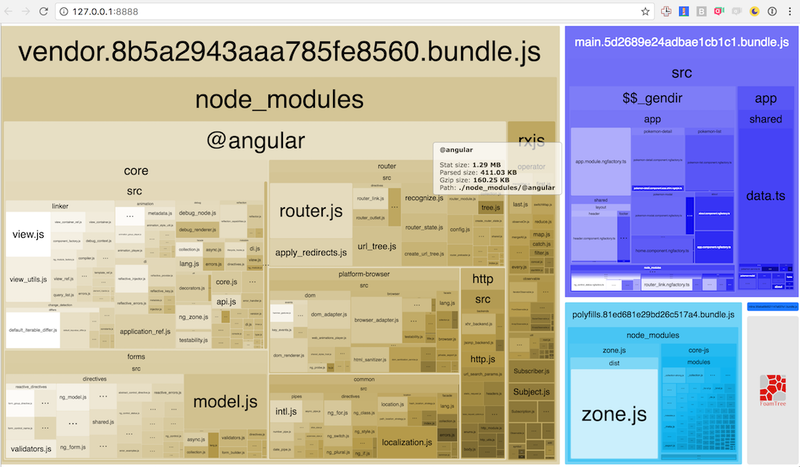 You should get on the assets section two bundles (your main app.js bundle) and (then new vendor bundle). Make sure to link the new vendor bundle that Webpack generated for you to be able to use your third party modules functions. You can Now try to access your app through a simple HTTP Server and open the Dev Tools Network tab to see the time it takes to load the app.js & vendor.js bundle and how it is loading faster. This part is so efficient when you have some parts of your app that only used on a specific scenario and not like on the app startup, let's say you have a registration system and of course users won't access that when accessing your web app but only needed when the client tries to register therefor there is no need to include it on the initial app bundle but what you can do is create a separated bundle for it that gets loaded Asynchronously in the background when the user asks for the registration page. And not only that, you can use it anywhere on your app when it comes to the possibility of lazily loading code. We will use the Experimental ES6 & Webpack Async import syntax that allows you to import either local or node modules only when needed without adding them to the main app bundle but adding them into a separate bundle that handles all the async code needed and since Webpack is smart enough to know which module is requested therefore it won't load the whole bundle but only a portion of it. First, make sure to install babel dynamic syntax plugin only if you are using a plugin but if you are using other loaders this depends on your loader so it's better to go with Babel. In our Demo App Case, we will use Async import to require the find function from Lodash package only when needed, but this doesn't represent thactualll use case of this method. As you can see instead of importing the find function from Lodash at the top of the module (which gets loaded on the startup of the application) we tried to import it dynamically using an Async call. Webpack will do all the heavy handling for us behind the scenes so you don't have to worry how the Request is going to be or where this is all being handled by our great friend Webpack. Remember on the split chunks vendor configuration we set the chunks to all (which includes support for all the types among this is the async) of course you can choose async only instead of all to only include dynamically imported code on the bundle instead of all type of chunks. Now run the build, you should see some difference in the sizes now and before using the dynamic import since some of your functions are being loaded Asynchronously only when needed instead of on app startup. You won't notice the difference when it comes to your app since Webpack is going to handle the request and module fetch dynamically behind the scenes but this is very efficient. You can try to search on how to use this with your specific framework or Web Server but you can check express-static-gzip for serving gzip & Brotil compressed bundles from an Express Web Server. Of course, those are not all the ways you can find out there for reducing Webpack's bundle size but by far those what I find most efficient and helps a lot with big bundles and large apps espicially single page apps that use React. For Compression it's a bit tricky and not fully supported by all the browsers which leaves you with some drawbacks on your App's bundle delivery.